The oldest of the brothers, Formendacil got his online name as user on http://classic-castle.com way back in the prehistoric year 2004. He was and is a serious fan of J.R.R. Tolkien and his username was devised to reflect that. As the oldest of the brothers, Formendacil was one of the first two to get into LEGO, with a used Fabuland set acquired for Christmas in 1992. Like all the Brothers, his childhood was filled with LEGO, and not just with playing and building, but with telling stories, many of which are the oldest extant layer of inspiration for some of his comics. Besides The Lord of the Rings and The Hobbit LEGO, Formendacil's favourite themes are Castle, Space, Star Wars, and Adventurers. His brothers particularly associate him with Royal Knights. The non-championship crossover musings of Advent 2018 were largely his work. 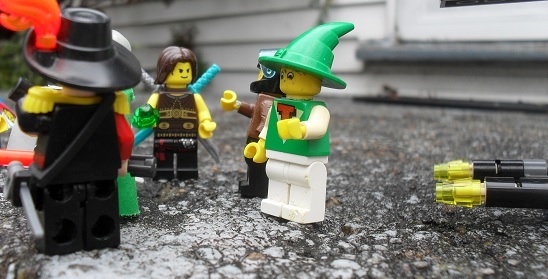 Android Files, an ongoing drama about Town figs getting caught up in the much larger doings of the LEGO-verse. Grandfather's Tale, now a mostly stagnant Castle epic. Aquazone Breakfast News, a comic that mostly surfaces during Advent. Crossed Bricks, which is a catch-all for any non-ongoing comic or story that doesn't have its own tale. 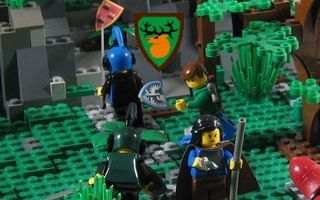 The second brother, Robinhood (another name started on Classic-Castle) claims the distinction of having the first LEGO set in the family: 6648 Mag Racer. 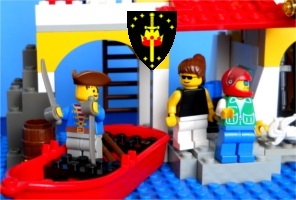 His LEGO-verse and Formendacil's were essentially the same during childhood, with the younger brothers scattered on the peripheries, but as Formendacil left for college--and less time for LEGO--things changed and Robinhood claimed an unparallelled dominance as the chief LEGO fan. Those who climb highest fall hardest, however, and he has spent several years in--well, if they're not Dark Ages, at least they're very Dark Grey (old dark grey) Ages. As such, he is the only brother with no webcomic. The middle-most of the Brothers, Elephant-Knight was the one who spear-headed Crossover Championship's first year, 2015. Like Formendacil, his choice of an online pseudonym started on Classic-Castle, and was chosen based off some homemade heraldry from his childhood. His first LEGO set was a Pirate polybag set in 1995, at the wee age of three, and Pirates have continued to be a favourite theme of his, together with Space, especially Blacktron (the second series in black, white, and trans-neon-green). Crossover Championship's 2016 soccer tournament was his sole creation. A Pirate's Life Where two merchants travel around the Legoverse, meeting new and interesting characters. Or you can follow M.A.P. a group of actual Pirates. F.E.Z. A group of Blacktrons get into crazy shenanigins. The most prolific webcomicker of the Brothers, Zack-ta's first LEGO set was a small Res-Q truck in 1998. Appropriate to the name of his main comic, he never did any much with Res-Q ever again. Very much his own man, Zack-ta was the only brother to never *really* have a Classic-Castle period or a Flickr account. He loves all themes, but is especially fond of Alpha Team and Bionicles. He created the 2017 tournament. The youngest of the brothers, Purple-Wolf's name came--you guessed--from when he joined Classic-Castle. He was on quite a Danju kick at the time, possibly because purple is his favourite colour. His first LEGO set was an Arctic polybag in the summer of 2000. Besides the Danju-faction of Knights Kingdom (the second one), he's known for loving Wolfpack, Power Miners, Bionicles, Exoforce, M-tron, and Aquazone. Rock Miners The many marvelous mischievous misadventures of miners.